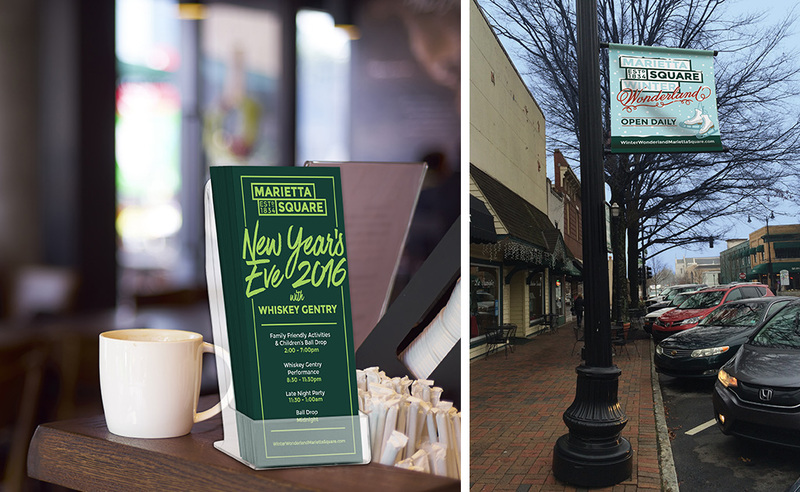 The Marietta Square branding signifies unity among the merchants, businesses, visitors and resident, so after completing that branding project, id8 developed a marketing strategy that called for line extensions of the brand for annual and ongoing events. This continual build would help align events with Marietta Square and continue to reinforce the new branding. The idea of putting an ice skating rink in the Square was the brain child of Sterling Wharton, president of The Branding Project. He and Chuck Burge, who was engaged to manage and run the event, were tasked with branding it. Sterling and Chuck came to us and asked for help…and id8 was engaged to bring “Winter Wonderland” and “New Year’s Eve” to life! 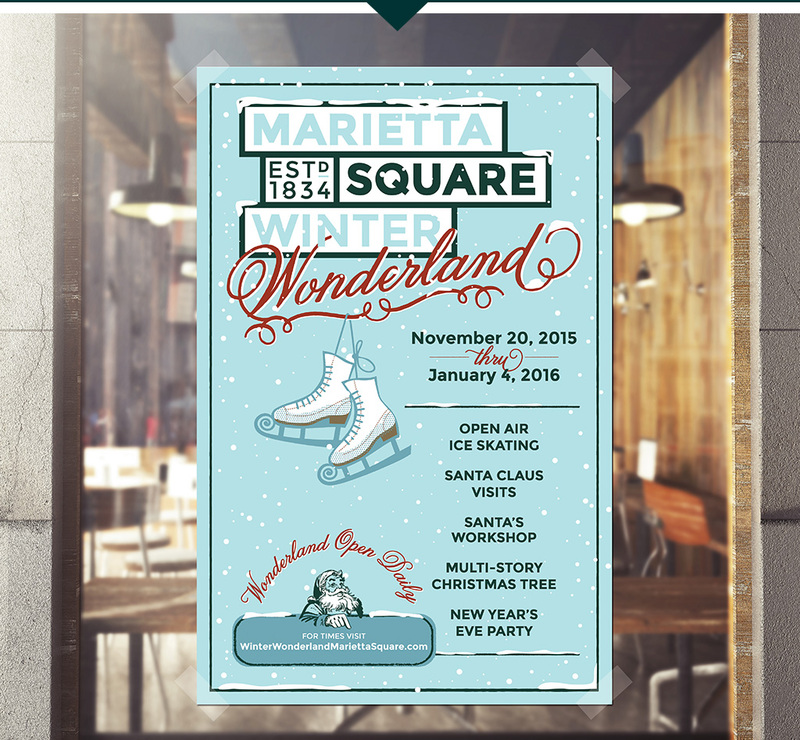 Before the advent of Winter Wonderland, Santa coming to the Square was an annual event, along with the parade and sleigh in which he entered Marietta. The challenge was that successful events like Santa and The Pilgrimmage already had well-known brands, and the Winter Wonderland needed to connect all of the events together and create consistency. Also, the New Year’s Eve event was brand new, with no brand or history to reference. id8 created a brand for both the Winter Wonderland and New Year Eve. Posters lined the windows of merchants in the Square. 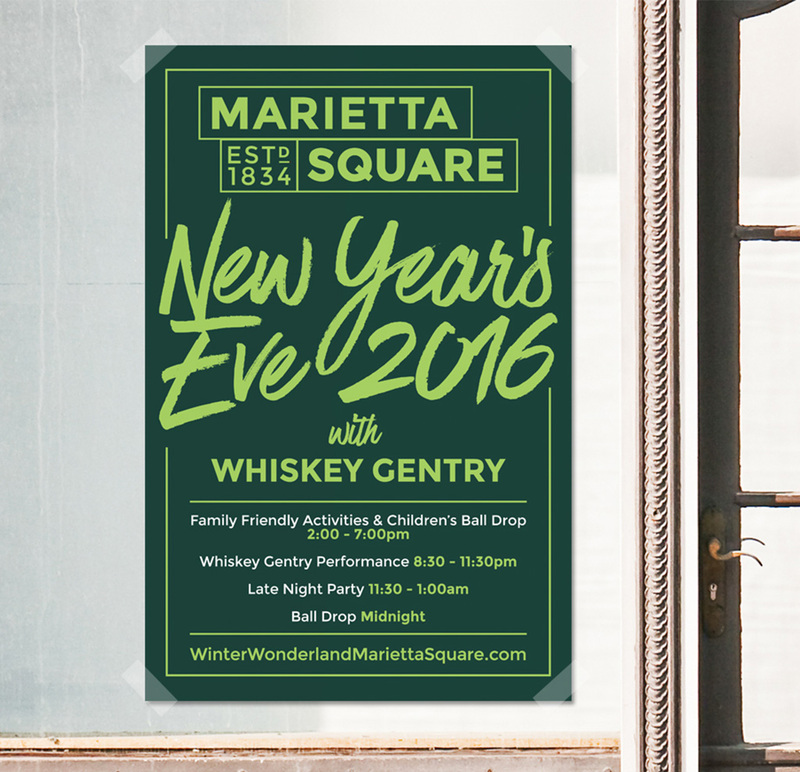 Eye-catching pole banners lined the Square with one side displaying the Winter Wonderland logo and the other displaying the New Year’s Eve logo—but maintaining the dark green and light blue color palette throughout. Billboards, digital media, email marketing, and a press party launched the grand opening. 15,085 skaters came to the Winter Wonderland, and even more impressive, 60,000 more visitors came with the skaters. The energy on the Square was unlike anything ever seen. It was filled to capacity; families of all ages were on the Square every day and every night of the week, beginning on Thanksgiving and through to the end of January. Merchants on the Square were able to provide food and drinks, shopping, theater, art, and more to all of those visitors, helping to create a full day of activities and memories for a lifetime for each and every person, as well as driving business to the area. And people didn’t just come once—they came two, three, even five times to skate again and again, each time bringing new people to the Square to join them. New Year’s Eve was a tremendous success as well, entertaining more than 20,000, people, and after New Year’s Eve, there were more than 90,000 social media posts about the event! News traveled all over Atlanta and beyond. Due to its success, the New Year’s Eve event was extended for another month.